Broadleaf plantain are perennial plants, grow upright, height 15-20 cm. Single leaf, long stem, arranged in root rosette. Round leaves like eggs until the lancet is widened, the edges are flat or jagged irregularly rough, the surface is slippery or slightly hairy, the curvature is long, 5 - 10 cm long, 4 - 9 cm wide, the color is green. Multiple inflorescence is arranged in a grain that is about 30 cm long, small, white color. Oval or oval fruit, containing 2 - 4 black seeds and wrinkles. Young leaves can be cooked as vegetables. This plant propagation by seed. 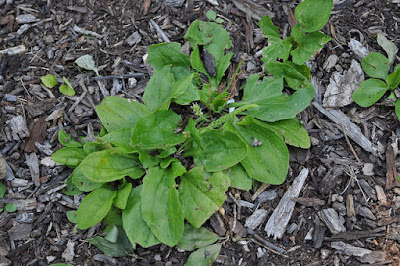 Broadleaf plantain (che qian chao) is sweet, cold, astringent, efficacious as an anti-inflammatory, urine decayers (anthropic), antiseptic, fever reliever (antipiretik), sputum decayers (expectorant), cough (antitusif), stop bleeding hemostatis), skin softener, improving vision by normalizing excessive liver organ activity, and eliminates thirst. Broadleaf plantain contains iridoid glycocides (such as plantagin, aukubin) flavonoids (apigenin), ursolic acid, beta-sitosterol, n-hentriacontan, and plantagluside consisting of methyl D-galactaconate, D-galactose, L-arabinose, and L-rhamnose . It also contains tannins, potassium and Vitamin (B1, C, A). Potassium is urine laxative (dieuritic) which will remove excess uric acid and dissolve the calcium salt deposits contained in the kidney, also as a hepatoprotector and antiseptic. Apigenin is anti-inflammatory, which can reduce swelling and pain in acute gout rheumatism. Broadleaf plantain herbs efficacious over gallstones, urinary tract stones, swelling due to kidney disease (nephritic oedema), and unsmooth urinate because of the heat. In addition it is useful to treat disorders of the urinary tract (such as urinary tract infections, greasy urine, bloody urine), acute hepatitis accompanied by yellow fever (acute isteric hepatitis), inflammation such as inflammation of the prostate (prostatitis), inflammation of the airways (bronitis), inflammation of the eye red, influenza, fever, whooping cough (pertussis), diarrhea, dysentery, gastric pain. Infusion of 10% and 20% spoon leaf to Ca and Mg solubility from kidney stones in vitro, had significant effect of dissolves calcium and magnesium from kidney stones compared to distilled water. (Ismedsyah, Pharmacy MIPA USU, 1991). Ursolic acid isolated from Plantago major hexane extract can inhibit cyclooxygenase-1 (Rinbgbom et al 1998). Prepare 10-15 grams dried leaves or 15-30 grams fresh leaves of Broadleaf plantain, boil the leaves with 3 cups of water until it remaining 1 cup of boiled water. After chilling, filtere and drink the water at once in the morning before eating. The woof can be boiled once more and drink in the afternoon. Or with the following recipes: Broadleaf plantain fresh leaves washed and pounded until crushed. Squeeze and strain until the water collected 1/2 cup. Add honey 1 tablespoon, then drink at once. Take about 30 g fresh leaves of Broadleaf plantain, wash and then boiled with 2 cups of water until 1 cup of boiled water remain. Let the water chill and then filter it, Drink the water twice a day, each 1/2 cup. Prepare fresh Broadleaf plantain leaves as much as 15 g washed and drain. Brewed with a cup of hot water. When it chill, squeezed and filtered, then drink at once. Prepare 60 g washed fresh Broadleaf plantain leaves then add water until submerged and 30 g sugar stone. Boil for about for 15 minutes. Drink it while warm. Prepare fresh Broadleaf plantain then washed and ground. Squeeze and strain until collected 1 cup. Add 2 tablespoons of honey while stirring. The juice, then double boil. Drink while warm. Wash Broadleaf plantain leaves and grind until crushed. Squeeze and strain until the water is collected 1 cup. Drink before meals. After the cold is filtered, the water is taken twice a day, each 1/2 cup.